Pepper Medical Products Pedi Tie Pediatric Trach Ties, 301P, 501P, Pedi Trache Tie. Pedi Tie Pediatric Trach Ties is designed to provide secure positioning of the Tracheostomy tube. 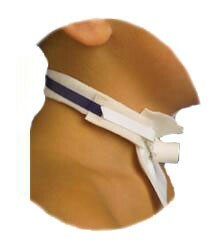 The Trach Neck Band attaches to the tracheostomy tube with fastener tabs. Soft, hypoallergenic, no stretch cotton on the Pedi Trach Tie ensures patient safety and comfort. Pediatric Tracheostomy Tube Neck Band reduces skin breakdown and is easy to adjust for proper fit. Latex-free. One size fits all. Note: Photos above display the Trach Neck Band along with the Pediatric Trach Tie combined. Soft, hypoallergenic, no stretch cotton ensures patient safety and comfort. Easy to adjust for proper fit. Stretch piece aids in securing trach while allowing for patient movement. Pedi Tie Pediatric Trach Ties Product ID Numbers: 301P, 501P. What neck size does the pediatric tie fit. 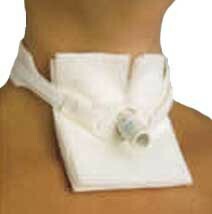 The trach tubes come in various sizes that fit various neck sizes. You may be able to request a specific neck size when you order, thus filling your order correctly.